A few varieties of reptiles visited the campus of MercyFirst! My afternoon group was the lucky one and got to meet the reptiles. Of course, the students brought their dogs along. As the reptiles were handed over, the dogs just sat and stayed under the chair. 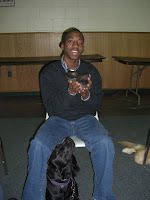 Good thing, none of them (both dogs and students) freaked out because of the reptiles! It was an odd, but a fun experience to touch different kinds of reptiles. Whatever the animal it is, they are all soothing and put a smile on everyone's faces!